Life is difficult if you're a girl. No matter if you are thin or fat. 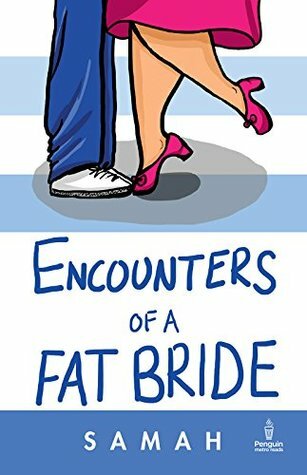 Encounters of a fat bride by Samah portray the hardship and struggle of a fat girl endure. The plot is based on the mentality of Indian society towards stoutness. The cover page is simple, and the title attracts the readers. The female protagonist Madhurima Pandey is an MBA student, loving, caring, and chubby. She is twenty-five years old, and like every Indian parent, they start groom hunting for their dearest daughter. Madhurima's overweight bothers her. She has low self-respect and looking for one person to say yes to her for marriage. She is jealous of her thin friends, and always looking for ways to avoid social gatherings. No one wants a fat bride. She goes through so many rejections, but one boy agreed to meet her again. His name his Harsh, he works in IT company. She starts suspecting that why a thin boy wants to marry an overweight girl. The story revolves around them and the pain or trauma they suffer. Soon Madhurima finds the hidden secret of Harsh which turns their lives into more chaos. The story further unfolds the hidden emotions of Madhurima and Harsh. Samah Visaria is bona fide in her story. She narrates the truth of Indian society and their endless expectations. The groom parent's demands are considered as God's wish, and if it is not fulfilled by the bride side then the marriage is called off, or the worst case scenario is they taunt or torture the girl lifetime. Every parent of the girl has to go through this crap, and they bow down for the sake of their daughter's happy future, but they have to understand that gifts or unnecessary expenses will not guarantee a lifetime of happiness. This story is an eye-opener for every girl. I like Madhurima's grandmother character so much. It's very difficult to find an open-minded woman. The story is filled with self-realization. It concludes many taboo topics. The most important thing one can learn from this is to never lose your self-respect and be happy in your own skin, accept who you are. This book makes you laugh. I really enjoy reading this book. I recommend it to every reader.